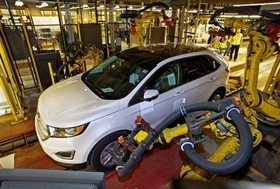 Driving early post-CETA gains in Canadian exports to European was a $424-million increase in shipments of the Ford Edge, which is built in Oakville, Ont. With the exception of “bright points” such as Magna and Linamar, Canadabased auto suppliers have been made complacent by a low dollar and easy U.S. access, he said. At the same time, government protection of industries such as banking and telecommunications stifles innovation and makes Canada less competitive. But attitudes can change as the country is forced to diversify. The terms of the trade deals could also be problematic. Canadian manufacturers are generally positive about CETA, which allows content from uni fied North American supply chains to qualify for tariff exemptions. But they are critical of “side-door” provisions in the Pacific Rim agreement that allow automakers and parts producers to bring in parts from low-cost nations as long as an operation such as welding, heat-treating or final assembly is carried out in a TPP country.